Since 2009, Paducah Arts Alliance (PAA) Artist-in-Residence Program has welcomed painters, potters, filmmakers, fiber artists and a host of other creatives to our vibrant river town, but today brings an artist of a different “mode.” Santa Cruz artist, Wes Modes, is concluding his historic voyage on the Tennessee River in a 1940s era shantyboat at the Port of Paducah. His residency, which runs from August 25 through September 6, includes a Secret History exhibit (on display at the River Discovery Center, 117 S. Water Street, and talks about the project at both the River Discovery Center and McCracken County Library. 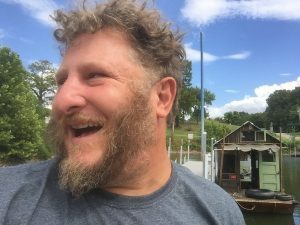 The shantyboat will be on display at the River Discovery Center at various times throughout his residency. Modes is a California artists focused on social practice, sculpture, performance and new media work. He received an MFA from the Digital Art and New Media program at University of California Santa Cruz (UCSC) and has exhibited his art and performed in the Santa Cruz region since 1996. He is also a UCSC art lecturer and curator at the Santa Cruz Museum of Art and History. “In other lives, I am a high-tech runaway, writer, community organizer, and geek,” said Modes. In the summers of 2014 and 2015, Modes embarked on epic journeys to discover, present, and connect the personal narratives of river people from the deck of a 1940s era shantyboat on the Mississippi River. He conducted over 50 oral-history interviews with Upper Mississippi artists, boathouse residents, scientists, researchers, historians, business owners, and adventurers. 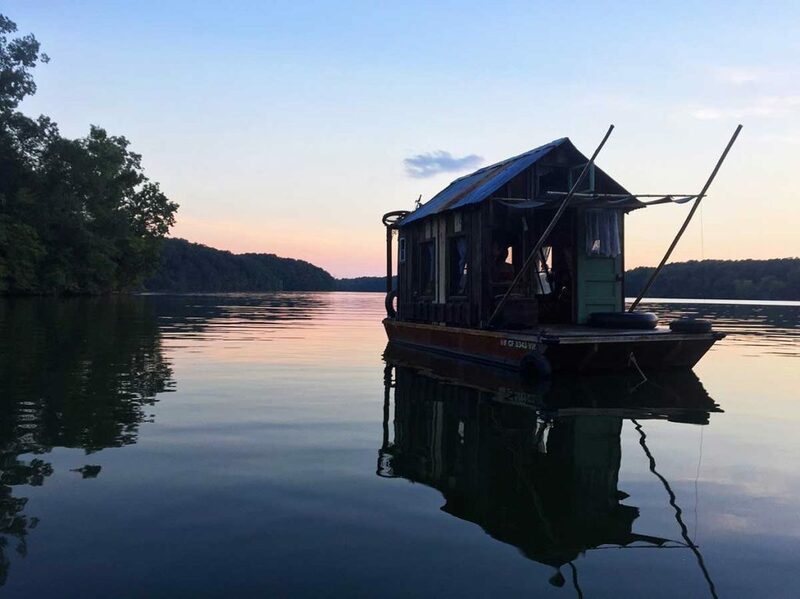 Modes re-launched the shantyboat on the Tennessee River this summer on a research voyage that started in Knoxville, Tennessee, progressed through northern Alabama, and now concludes in Paducah, Kentucky where the Tennessee meets the Ohio River. “The Secret History of American River People is a dialogic and participatory art piece, firmly rooted in a people’s history tradition,” said Modes. Throughout both journeys, Modes has used the project website and social media to share stories, photographs, and video to connect river people with those far from the river. “The interviews reexamine the issues currently and historically faced by people living or working on the river,” said Modes. Outcomes of the project are expected to include a research archive, short and feature documentaries, and a series of books. “These archives telling otherwise untold personal narratives are a significant cultural artifact with wide-reaching significance to people living and searching for solutions to shared challenges in river communities elsewhere on the continent,” said Modes. Persons wishing to share their oral histories and stories can contact Modes during shantyboat or exhibit viewing hours or email him directly to set up an interview at wes@peoplesriverhistory.us. Artists participating the PAA’s Artist-in-Residency Program are required to engage with the community through exhibitions, workshops, public lectures and/or collaborative projects with local artists. The community events associated with the Secret History would not be possible without the willingness and assistance from community partners including: the River Discovery Center, McCracken County Library, City of Paducah Planning Department, Paducah Parks Department, and the Paducah Expo Center. To arrange an interview, contact Modes directly via (831) 704-6690 or wes@peoplesriverhistory.us. For additional information about the project, visit his website.